There are so many smart plugs out there these days that it can be difficult to choose one when you’re looking to add smarts to your “dumb” old devices. You can cut the big-name brands out of the running right away since they typically charge between $25 and $30 for a device that every other company sells for about $20. 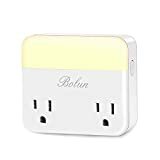 There’s a new option out there that you might not have heard of yet, but you won’t soon forget it when you see what kind of value the Bolun Wi-Fi Smart Plug with Night Light offers. It gives you not one but two smart outlets that can be individually controlled using the app, Alexa, or Google Assistant. Plus, there’s a built-in night light, which is something you’ve probably never seen on any other smart plug. $29 is a great price for this dual-outlet device, but use the coupon code NM5Q8M39 at checkout and you’ll pay just $17.39.